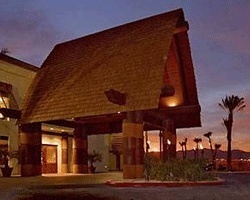 Located just three miles from the Las Vegas Strip, *Tahiti* is a Polynesian-themed resort. Guests will enjoy the spacious two-bedroom suites or the deluxe sleep-eight suites, both of which have a separate lock-off with a kitchenette. One- and two-bedroom accommodations have a fireplace, television, DVD, stereo system, whirlpool tub, and a separate whirlpool tub and shower in the deluxe suite. 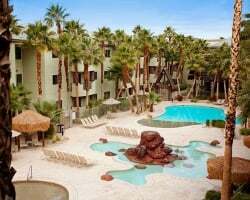 Amenities include an exercise room, massage services and facial treatments, sundry shop, two sand-beach swimming pools, poolside palapas, barbecue picnic area, putting green, concierge activity desk, and transportation to and from the Strip. 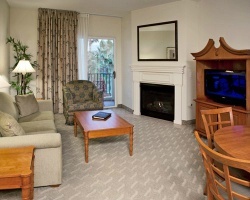 Renter will enjoy a luxurious villa with the finest amenities! 10-day rental! Check-in Friday April 19th & check-out Monday April 29th! Inquire now! Book a week in Vegas today! Vacation at this exotic Las Vegas resort! Pick your Red season week & stay in a beautiful Bora Bora suite! Book your trip now! Reserve Your Floating Week in Fabulous Las Vegas Today! Make an inquiry today for your next vacation in Vegas! Secure your next week in Vegas! Family and friends are welcome! Pick the week that is right for your next trip! Perfect for a Las Vegas vacation! Inquire today for available weeks!